The relations between Iraq's northern Kurdish self-governing region is straining relations with Baghdad by inking more oil deals. Iraq's government is seeking centralized control over the country's oil resources. In a statement issued Wednesday on its Web site, the Kurdistan Regional Government said it had approved four new production sharing contracts with international companies and had sanctioned the construction of two new refineries. It said two contracts already had been signed - one with Heritage Energy Middle East Ltd., a subsidiary of the Canadian firm Heritage Oil and Gas, and a second with Perenco S.A., an affiliate of a French company of the same name. The two additional contracts were to be announced soon. Kurdistan officials said the four contracts are worth about $500 million, while the new refineries are worth about $300 million. If exploration leads to oil production, the deals call for the companies to split profits, with 15 percent going to the companies and 85 percent to the government. A spokesman for Iraq's oil ministry, Assem Jihad, denounced the agreements, saying the government has "made it clear not to sign any contract until the new oil law is passed." The contested oil legislation is among 18 benchmark laws pushed by Washington, D.C. to encourage reconciliation among Iraq's ethnic and sectarian factions. It's intended as a way of managing the country's vast reserves, while ensuring profits are shared equitably. Last February, the Iraqi Cabinet approved a draft of the law and forwarded it to parliament, but parliament, citing legal technicalities, kicked it back to the Cabinet. The measure has been bogged down in negotiations ever since. Complicating matters, the Kurds in August enacted its own law governing foreign oil investments, angering the central government in Baghdad. A U.S. embassy official on Thursday said the independent action by the Kurds was "not very helpful." "The Kurds are basing the agreements on a regional Kurdish hydrocarbon law and that law still needs to be married up with a federal hydrocarbon law," said the official, who spoke on condition of anonymity because of the sensitivity of the issue. "The real question is why would any company be willing to invest significant capital in a deal that would likely be at some point subject to challenge within the Iraqi courts," the official added. The Kurds have signed other contracts with international oil companies, most recently with Texas-based Hunt Oil Co. for production sharing in the region. That agreement, declared illegal by Iraq's oil minister Hussain al-Shahristani, a Shiite, underscores the central government's position that exploration contracts with foreign companies cannot be signed until new legislation is in place. The regional Minister of Natural Resources in Kurdistan defended the new deals, saying they will spearhead international investment in Iraq. 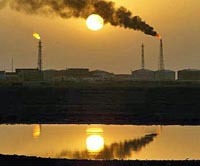 "New oil discoveries under these contracts will bring large amounts of new revenue for sharing throughout Iraq," Ashti Hawrami said on the Web site.